Another day, another crypto exchange hacked. Maybe it’s just me but something is seriously wrong if the payment system of the future is being plundered with such frequency. I needed to see for myself what these losses really meant in terms of my crypto trading and what I found was rather shocking. So lets take a look at crypto losses and realistically assess the risk of theft when trading cryptos. Hopefully this will help you reconcile whether it makes sense for you. Fans of crypto (and I count myself among them), are quick to point out that the hacks are not in the blockchain protocol itself, but rather in the exchange infrastructure. This is without question true, but it doesn’t make sense to distinguish crypto’s crowning achievement, blockchain, from the infrastructure as a whole. It is as though we are examining air travel and saying that the airplane is a technical marvel and statistically safe, but the takeoffs and landings will kill you. Crypto exchanges are very much the runways to the crypto world and that they are so dangerous is cause for concern. According to cybersecurity experts “Carbon Black”, over $1.1billion of cryptocurrency was stolen in the first half of 2018. This is without question a large sum, but let’s provide some context. First, we can compare it with the total crypto market capitalization. The rough average crypto market capitalization for the first half of 2018 is around $250,000 million and well down from its peak due to a broad price decline. 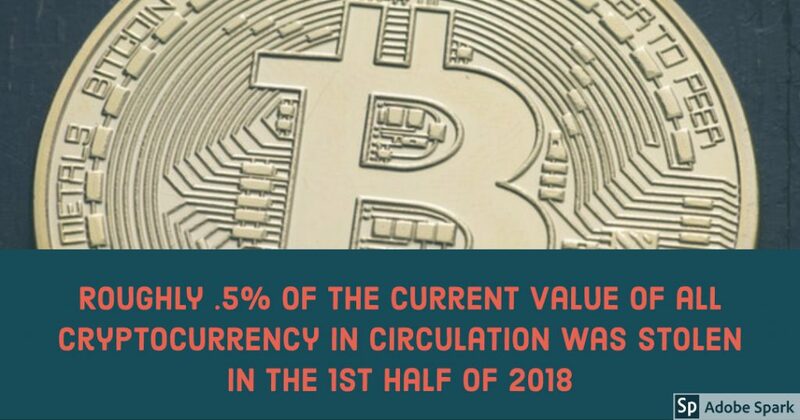 What this means is that roughly .5% or 1 out of 225 dollars of all crypto currency in circulation at current values was robbed in 2018. This is certainly a large and unacceptable number but we do need to keep in perspective that earlier heists had larger values in part due to higher coin valuations, thus inflating their impact if we compare them with current market valuations. In order to get a better feel for the risk, lets compare this with credit card losses, since we all use credit cards every day and accept the hazards that these digital predecessors to Bitcoin bring. In my brief analysis, cryptos are roughly 2.5 more times more likely to get robbed than credit cards! Let me walk you through how I derived this. 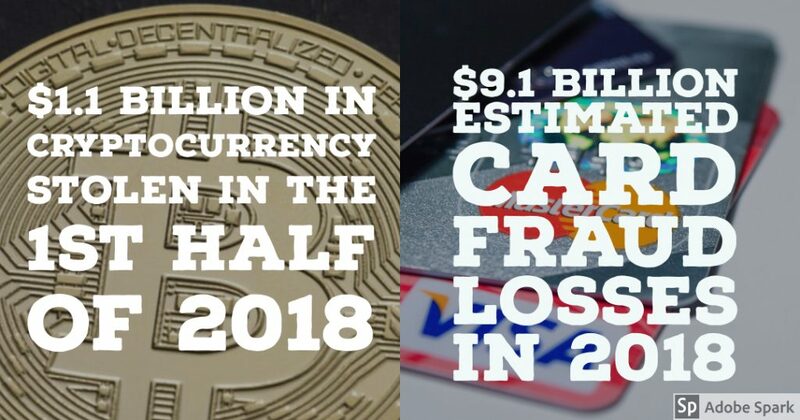 If we look at US data, we see that the crypto theft is dwarfed by the roughly $9.1 billion in payment card fraud losses predicted for 2018. Now consider the relative market sizes, the digital payment market in the US is roughly $6,850,000 million and the global total crypto market exchange trading volume can be estimated to be around $332,000 million. This number is relatively low and shows that “hodlers” are in fact holding onto their crypto rather than actively trading. Now here’s where it gets startling. The actual losses on traded crypto are around 1 dollar lost per 300 dollars traded. Meanwhile, for electronic payments, 1 in 760 dollars in transactions are subject to theft. Of course this is still a large number, one that made me double check my figures, which I stand by. The upshot is, you are roughly 2.5 times more likely to get robbed while trading crypto than while using your credit card. A risk that some are willing to face due to the perceived value of holding cryptos. So now for some more bad news. Cryptos are riskier than the plastic cards we keep in our pockets for two reasons. The first is the aforementioned chance of fraud — which at more than twice that seen with credit cards, is offputting, but still fairly low. 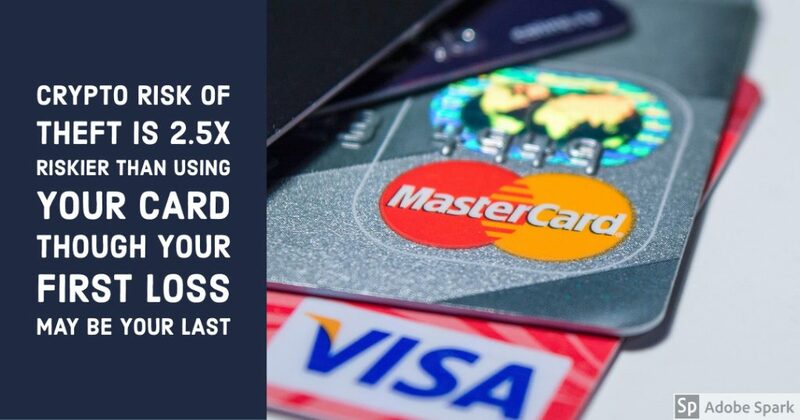 Far more significant is the fact that while the cost of most credit card theft is covered by your bank, your crypto loss may wipe out your entire trading account and you will not recover your loss. How often would you use a credit card if you knew it could subject you to financial ruin and you doubled the risk? Not so often, I’m sure. Please note that my comparison is very much “back of the napkin” and the numbers are very approximate. My data sources are somewhat limited and I made a few assumptions, which I’ve outlined in the notes below. In the final evaluation it’s the scale of the thefts from exchanges has been so stunning. Most of us aren’t used to reading about $100m being robbed at a time with thousands of accounts emptied. Certainly these events stoke our fears far more than the pernicious $15.00 charge that we suddenly find on our credit card statements. High frequency and large value thefts of crypto stick in memory and have a high impact on increasing our perception of the actual risk even if the likelihood is relatively low. This analysis is intended to shed light on what’s going on with crypto and provide a level of risk measurement that everyone can relate to. Crypto exchanges need to do a lot more work on securing their systems from theft and it seems clear that many of the smaller exchanges are hampered in doing so by either hubris or greed. These thefts are killing cryptocurrency’s credibility and greatly slowing its adoption. If you are surprised by these numbers, think about how much much crypto you want to trade or hold in any single account. Diversification across exchanges will reduce your risk. If, however, the potential exposure doesn’t bother you, then trade away. The issue isn’t whether you trade or not but that you understand and acknowledge what your risks are. Thanks for reading. Please do me the favor of commenting, liking or best of all sharing, this article with someone it might help so that my message gets out. If you want to discuss fintech, AI or find expertise in Singapore, feel free to drop me a line. Theft is nothing new and this painting catches the moment a wealthy young man is having his fortune told and being robbed at the same time. This is a bit like crypto in that we are being told that the future of markets is “blockchain secure” while theft and manipulation run rampant. 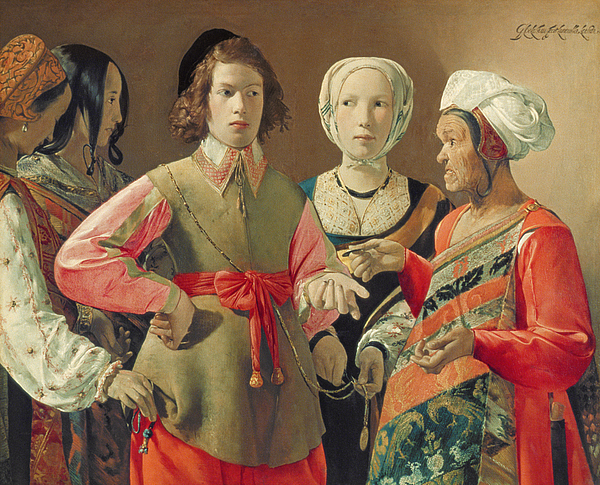 As the young man is engrossed in the fortune telling, the leftmost woman is stealing the coin purse from his pocket, while the pale-faced girl is stealing a medal attached to his chain. Note: Total card payments value of $5.98 trillion in 2016 increased by 7% per annum to get an estimate for 2018. Bitcoin Trade Volume Bitcoin has roughly 40% market of all crypto trade volume scaled to 100% to capture all trading. As one of the most actively traded coins this assumption is conservative. Richard Turrin is an award-winning executive with over 20 years experience in fintech innovation. Rich most recently served as the senior executive heading fintech for IBM Cognitive Studios Singapore and worked for much of his career as a banker in fixed income. He is now an independent Consultant and helps clients navigate the uncharted waters associated with the latest AI and cognitive technologies. He is the author of Innovation Lab Excellence, co-author of the InsurTech book and enjoys spreading the message of digital transformation through conferences and blog posts.